Peck Allmond is a multi-instrumentalist and composer based in Brooklyn, NY. His primary instruments are trumpet, flute, and tenor sax; and he doubles fluently on a long list of other brass and woodwinds including clarinet, bass clarinet, alto flute, piccolo, mellophone, peckhorn, euphonium, sousaphone, and soprano, alto, and baritone saxophones. He also plays the kalimba, a beautiful harplike thumb-piano related to the mbira, to which he brings an unusual degree of virtuosity. Peck has performed and/or recorded with Me’Shell NdegeOcello’s Spirit Music Sextet, Oliver Lake, Peter Apfelbaum, Don Cherry, Julius Hemphill, John Hicks, Rickie Lee Jones, Rufus Wainwright, Ray Lamontagne, Sean Lennon, Will Lee, Randy Newman, Lenny Kravitz, and James Brown; and leads his own units, the Peck Allmond Group and Kalimba Kollective. His compositions were performed by the late jazz legend Jackie McLean in McLean’s quintet. 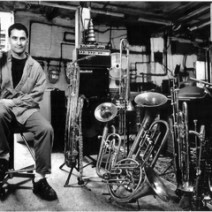 Peck studied classical and jazz trumpet at New England Conservatory of Music with Robert Nagel and John McNeil from 1980-82, and earned his B.A. in Music from the University of California at Santa Cruz in 1986. He has also studied trumpet and saxophone at intensive jazz workshops in Banff, Alberta, Canada; Naropa Institute, Boulder CO; and Creative Music Studios, Woodstock, NY; with Dave Liebman, Steve Coleman, Kenny Wheeler, Dave Holland, Cecil Taylor, Charlie Haden, and the Art Ensemble of Chicago. He has taught privately, in schools, and at numerous jazz camps for close to three decades. Since 2005, Peck has been the trumpet clinician for the Monterey Jazz Festival’s “Traveling Clinician” program. For more about Peck, visit www.PeckAllmond.com.